When my parents went on their cruise around the Hawaiian Islands last year, they came back with stories of visiting a black sand beach on the Big Island and seeing sea turtles. Black sand beaches and sea turtles certainly piqued my curiosity as the idea of a black sand beach from eroded lava rock and seeing a Hawaiian green sea turtle in person were just fascinating. My husband and I have a definite love for all things turtle. So naturally, knowing that my husband and I would be spending some time on the Big Island during our Hawaiian vacation, we knew that visiting this black sand beach would be high on our list. Luckily, the beach itself wasn’t too far away from Hawaii Volcanoes National Park, the highlight and main reason we decided to spend a few days on the Big Island over other touristy locations. With our rental car, we hit the road from Kona and headed south towards the southern shores of the island. 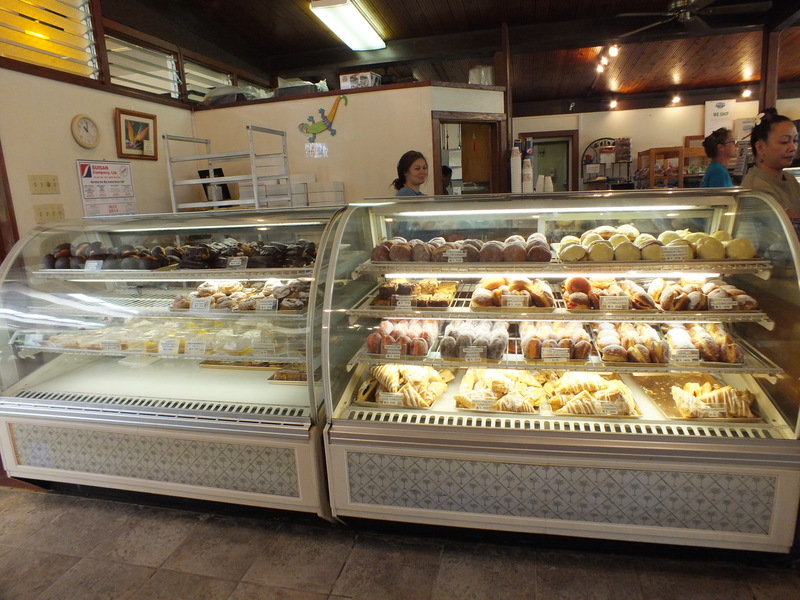 Before reaching Punalu’u Black Sand Beach, I had read about a bakery in the little town of Na’alehu called Punalu’u Bake Shop. As it was on our way down the road, we just had to make a stop. 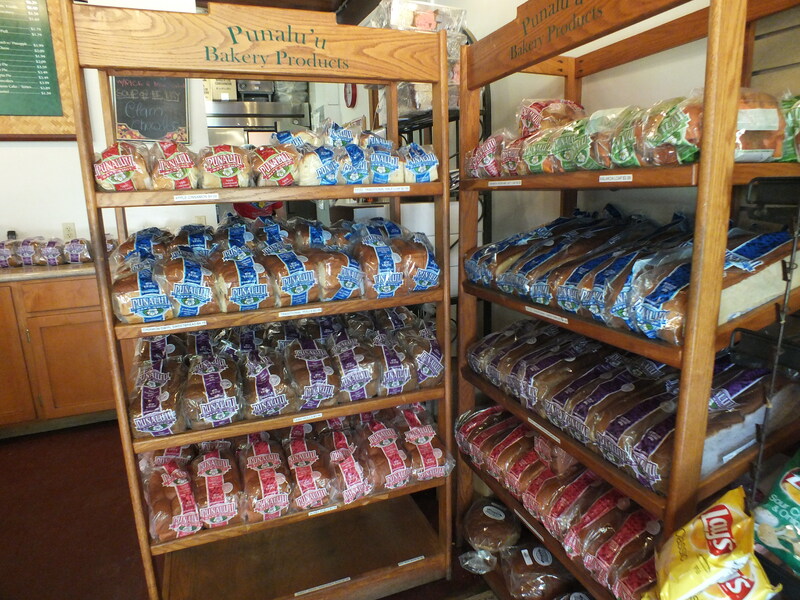 Punalu’u Bake Shop proudly calls itself the “Southernmost bakery in the USA.” Seeing as Na’alehu sits near the southern tip of the Big Island of Hawaii, which is the southernmost island in Hawaii, I guess they can lay claim to this title. Known for its sweetbreads (no, not those sweetbreads) based on a family recipe which became a hit at a local resort in the 1970s, Punalu’u Bake Shop was opened in 1991. 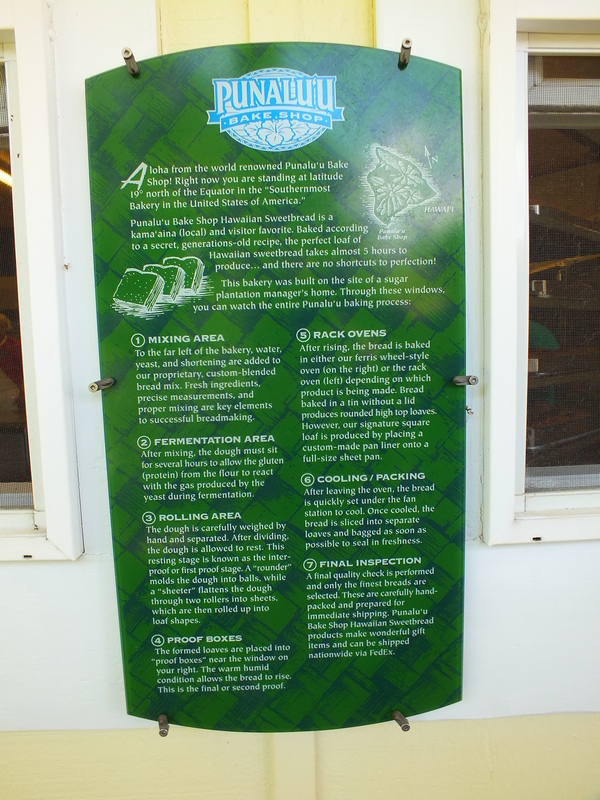 Today, it is visited yearly by more than 200,000 visitors and is known as the most visited bakery in the state of Hawaii. In addition to sweetbreads, it also churns out malasads which are very popular with locals and tourists alike, as well as serving traditional Hawaiian plate lunches and other sandwiches and snacks. 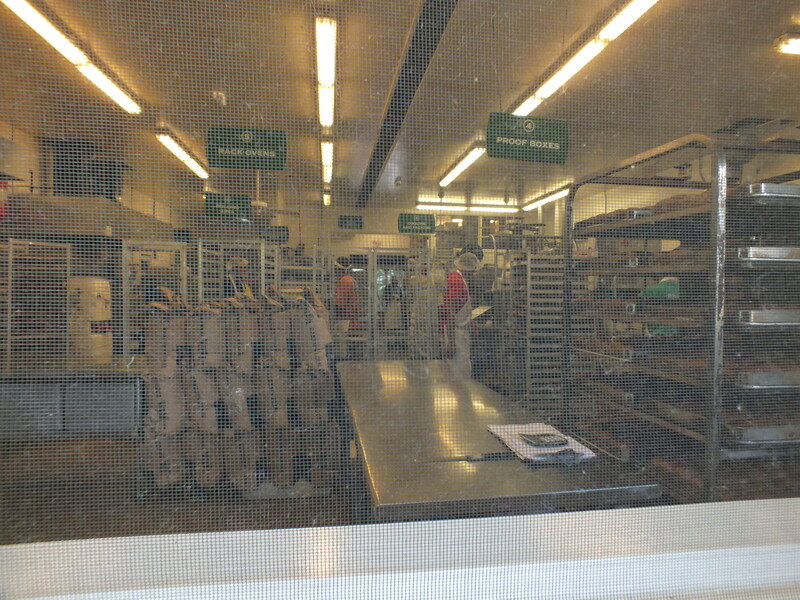 As you walk up to the bakery, you can look into their production shop to see how they churn out their famous sweetbreads, malasadas and other baked goods. There’s the mixing area, the fermentation area, the rolling area, the proof boxes, the rack ovens, the cooling/packing area and the final inspection area before the goods are either set out at the bakery or before they are shipped to various locations. The first thing you see when you walk into the bakery is a display of their famous Hawaiian sweetbreads. There are several different varieties, including original, apple cinnamon, taro, guava, kalakoa and cinnamon raisin. We couldn’t leave Punalu’u Bake Shop without trying some of these sweetbreads, so we bought a loaf of rolls of the traditional variety. 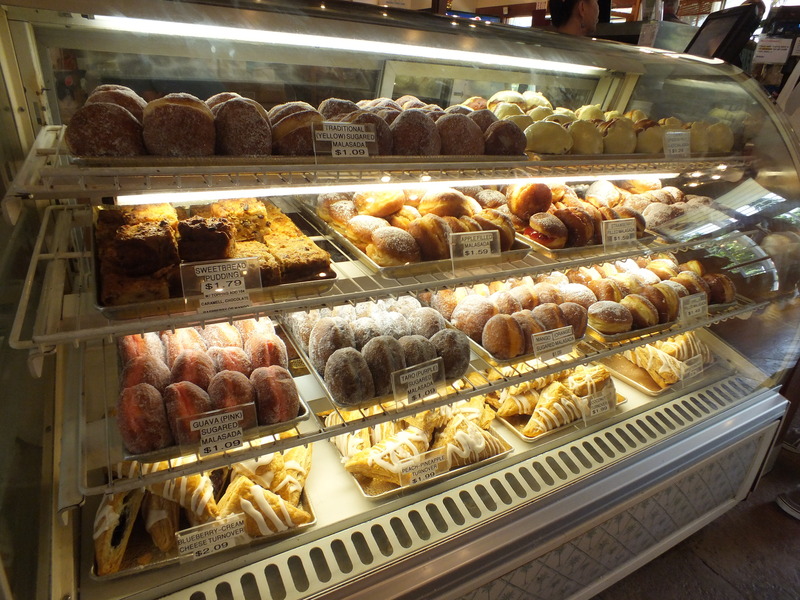 As you walk further into the bakery, you see the display cases filled with their famous malasadas and other yummy baked treats. In addition to malasadas, there was sweetbread pudding, blueberry cream cheese turnover, peach pineapple turnovers, coconut turnovers and traditional apple turnovers. That sweetbread pudding looked good and probably would be something I would be interested in tasting if I didn’t already have in mind that I wanted to try some malasadas. The next display case was filled with eve more treats. There was lilikoi cheesecake, lemon meringue pie, macadamia nut pie, chocolate haupia coconut pie, cream puffs, Bismarck’s filled with Bavarian cream, and chocolate eclairs filled with fresh whipped cream. Literally, I could have tried one of everything. They all looked so yummy. Ultimately though, the main reason we visited Punalu’u was for their malasadas. A malasada is a Portuguese yeast dough that is deep-fried and coated in granulated sugar, essentially a Portuguese version of a donut that is more square in shape and without a hole in the middle. Though malasadas were created in Madeira islands, in the 1870s when a large wave of Portuguese immigrants from Madeira and the Azores arrived on the islands to work on the plantations they brought with them some Portuguese recipes from their homeland. One of the recipes that has become a staple of what is known as Hawaiian food is the malasada. Today, it’s more than just a yeast dough that is deep-fried, the Hawaiians have added their own spin on the malasada by filling it with all sorts of creams and jellys and flavoring the dough itself with all sorts of tropical fruits native to the islands. It’s not unusual to find guava, taro and mango malasadas along with your traditional sugar-coated malasada. 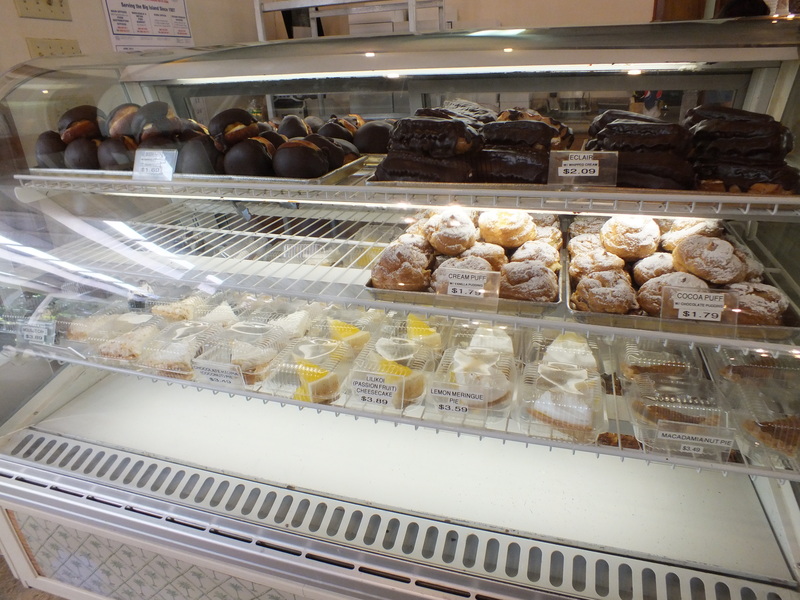 We decided to pick up some traditional sweetbread and a few pastries and of course some malasadas for the road. We’d take our goodies and enjoy them just down the road at the Punalu’u black sand beach. The sweetbread was delicious, nice and soft with a hint of sweetness. Since it wasn’t overly sweet the way some sweet breads can be, this is the type of bread that could be used for sweet or savory applications. The pastries at Punalu’u were amazing. 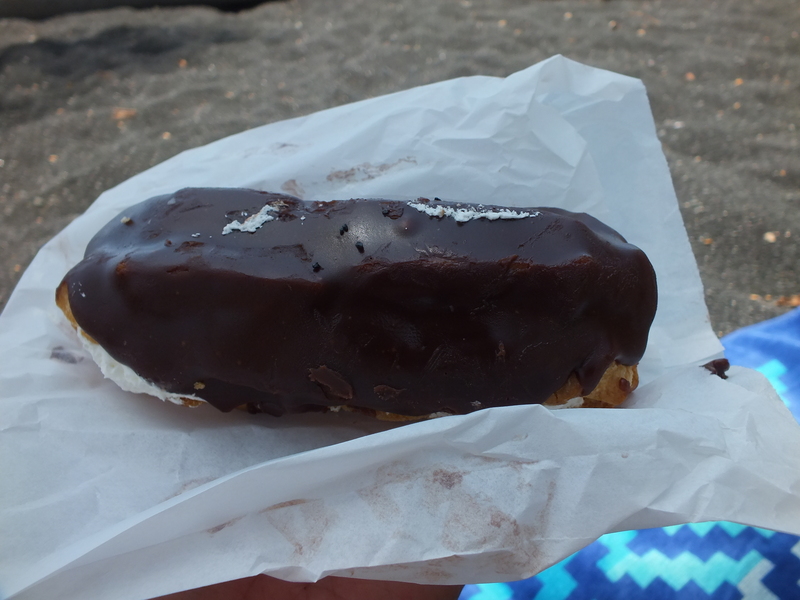 I ordered the chocolate covered éclair with fresh whipped cream. The choux pastry for the éclair was terrific, light and airy and fluffy. The chocolate coating was fantastic and not too sweet and not too thick. And the fresh whipped cream inside the éclair really was the topping on the cake, so to speak. It was fantastic and really brought together the airy choux pastry and the sweet chocolate. One of the most perfect eclairs. 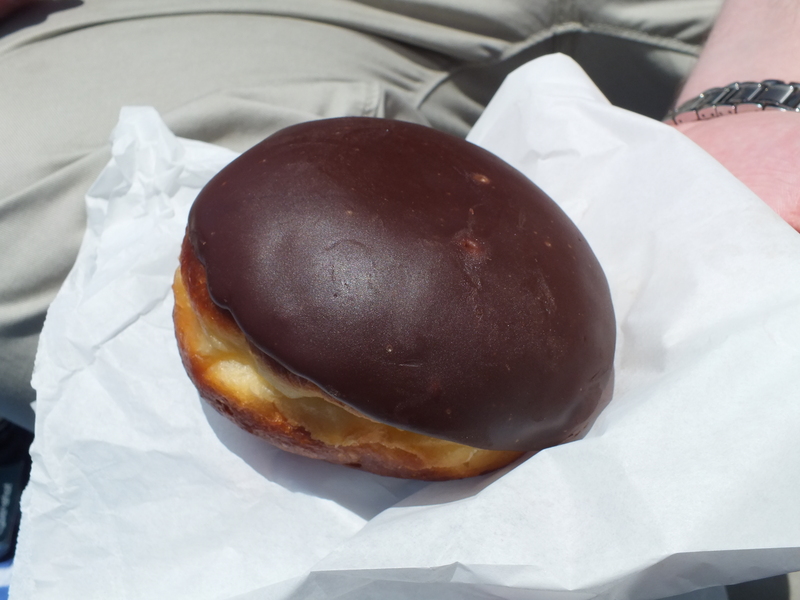 My husband chose to go with the chocolate Bismarck filled with Bavarian cream. My husband liked this Bismarck as it had just the right amount of Bavarian cream filing. At times, when you order a Bismarck, it can be overfilled to the point where each bite just leaves you messy as more and more filling falls out of the Bismarck. The dough was perfectly fried and the chocolate was just the right amount adding the right touch of sweetness to blend with the creamy Bavarian cream. On to the malasadas. 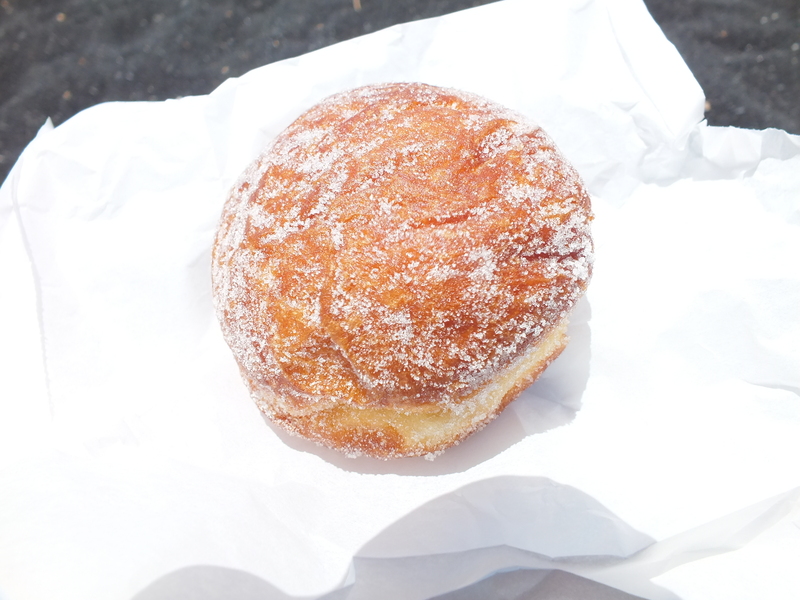 I decided to go with one traditional malasada, which means its fried dough covered in sugar. Even though this is described as a Portuguese donut, in no way does this traditional malasada even taste like a sugar donut. The dough for the malasada seems much lighter and more airy. It’s not a heavy fried dough, it’s like biting into a soft pillow that just has a dusting of sugar, enough to add a bit of sweetness to each bite. Fried food is never a bad thing, but these malasadas seem to raise the bar to a new level. The perfect midday snack. My husband went with a more traditional Hawaiian-style malasada with the taro malasada. The taro flavor was infused in the dough itself, which is what gives the dough it’s traditional purple taro color. 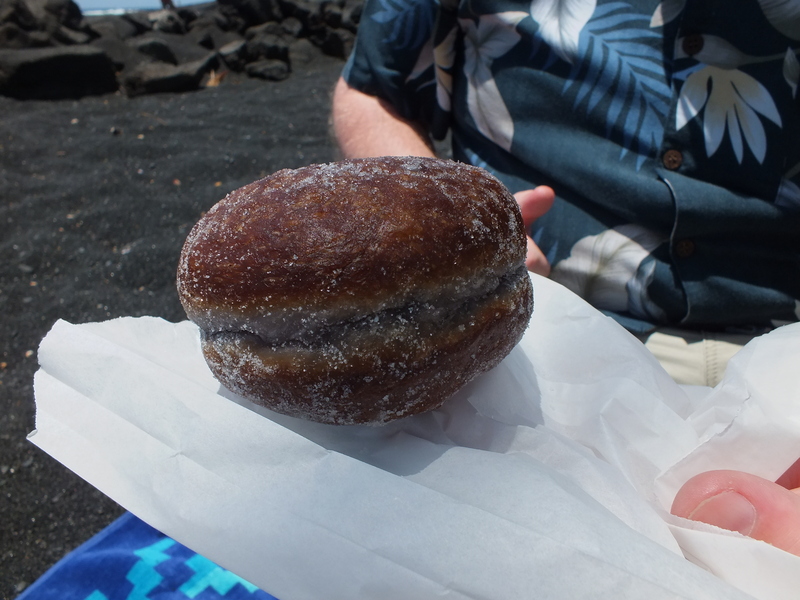 This also creates a pretty malasada when you open it up inside and see this pastel purple color. The fried taro malasada is also coated in a little bit of sugar to add some sweetness as well since taro flavor on its own doesn’t impart too much sweetness. My husband was really happy with his taro malasada as he said he could taste a hint of taro and this malasada too was nice and airy and fluffy. For his second malasada, my husband went with the lilikoi-glazed malasada. Lilikoi is a Hawaiian passion fruit which is popular in flavoring a lot of items around the islands from drinks, to ice cream, to shave ice to malasadas. In this case, a lilikoi glaze was created and then poured over the malasadas after they were fried. My husband was a little apprehensive that the lilikoi glaze might be too sweet, but ultimately discovered that it was a little tart rather than overly sweet, so that worked out. Although the glaze was a bit thick for the malasada, it gave the malasada good flavor, and the size of these malasadas are small enough that it wasn’t too difficult to finish. My second malasada was the vanilla malasada. Unlike the traditional, taro and lilikoi one, the vanilla one had a cream-filled center. 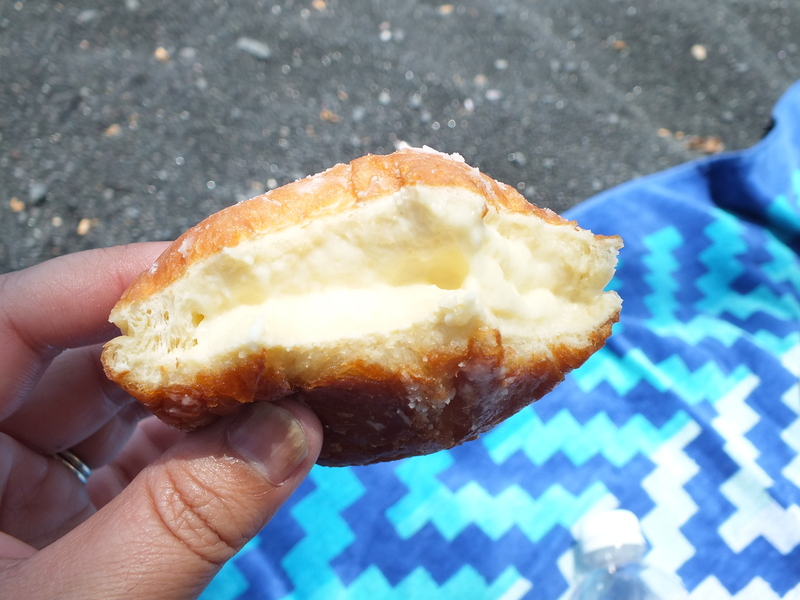 After the malasada is fried, it is then filled in the center with a vanilla cream. I really liked this one. You still get the lighty and fluffy fried dough, but then you also get the surprise of the light vanilla flavored cream in the middle. But then again, I’m a big fan of cream filled donuts, so it probably makes sense that I would like a cream filled malasada. I thought that the cream really made the malasada nice and moist, especially since these weren’t malasadas that were made fresh and hot out of the fryer and made-to-order. 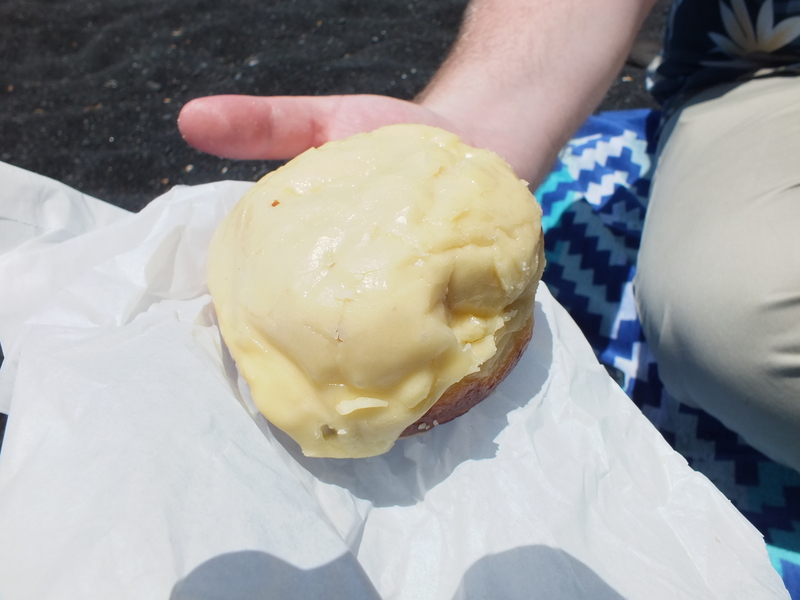 After my first experience with the popular Hawaiian treats known as malasada, I was smitten. These amazing little balls of light and fluffy fried dough, sprinkled with sugar, or glazed, or filled or baked with some sort of flavoring, were just so wonderful. And the Hawaiian sweet bread was definitely something I could live off of. 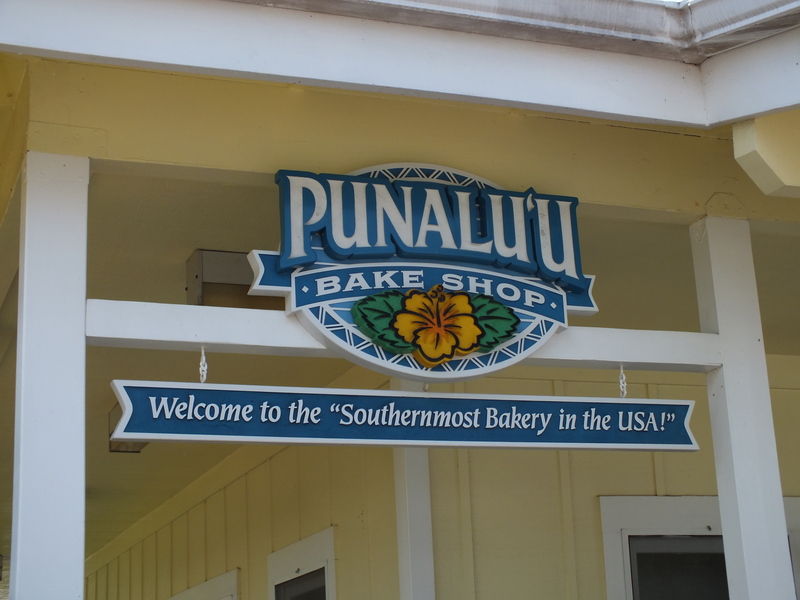 While it’s catchy for Punalu’u Bake Shop to call themselves the “Southernmost Bakery in the US”, they’ll be remembered by me for their pastries rather than their catchy slogan. Maybe it was the sweet malasadas, or the fact that we enjoyed them on the black sand beach at Punalu’u with the sun shining down and sea turtles resting on shore, this is the perfect bakery to stop at on your way to/from Kona down to Hawaii Volcanoes National Park or Punalu’u Black Sand Beach. You can’t really go wrong with whatever you order. Next time I’m on the Big Island, I’ll be sure to stop by again for some great malasadas.